Two Nigerian Airports have been ranked top among the world's most worst 20 airports. 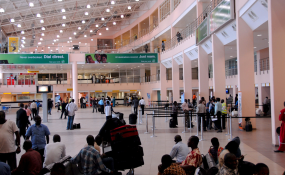 The two nation's airports in the ranking are: Port Harcourt International Airport, Omagwa and Murtala Muhammed International Airport (MMIA), Lagos, according to a survey by renowned aviation organization, Sleep in Airport (sleepinairports.net) yesterday. The survey ranked Lagos the fifth worst airport in the world, while Port Harcourt was ranked the third worst airport globally. The criteria used included comfort (gate seating and availability of rest zones), services, facilities and things to do, food options, immigration/security, customer service, cleanliness, navigation and ease of transit and sleep-ability. The website explained that the airports that appeared on the list of worst airports in the world are those that have the capacity to truly offend travelers. Lagos Murtala Muhammed International Airport, Nigeria (LOS). Others are: Santorini Thira National Airport, Greece (JTR); Dar es Salaam Julius Nyerere International Airport, Tanzania (DAR);Rhodes International Airport, Greece (RHO); Paris Beauvais-Tille Airport, France (BVA); Tashkent International Airport, Uzbekistan (TAS); London Luton International Airport, England (LTD) and Rome Ciampino International Airport, Italy (CIA). Others include: Kathmandu Tribhuvan International Airport, Nepal (KTM) and New York City LaGuardia, USA (LGA); Chania International Airport, Greece (CHQ); Caracas Simón Bolívar International Airport, Venezuela (CCS),; Guangzhou Baiyun International Airport, China (CAN); Cluj International Airport, Romania (CLJ); Islamabad Benazir Bhutto International Airport, Pakistan (ISB) and Addis Ababa Bole International Airport, Ethiopia (ADD). It will be recalled that Nnamdi Azikiwe International Airport awarded safety and security certification by the Nigerian Civil Aviation Authority, NCAA. The agency promised to certify PortHarcourt, Kano, Enugu airports before March next year. According to him, "This pilot project which was designed in line with lCAO vision of "No Country Left Behind" included Nigeria, Gambia, Senegal, Niger, Mali, Cameroon, Burkina Faso and Cote d' Ivoire." "It is also interesting to note that with the certification of Abuja airport today, Nigeria has become the first state to achieve the certification of more than one international airport in the AFI Region." "However, we are not resting on our oars as the certification of Kano, Port Harcourt and Enugu airports are scheduled for completion in the 1st, 2nd and 3rd quarters of 2018."